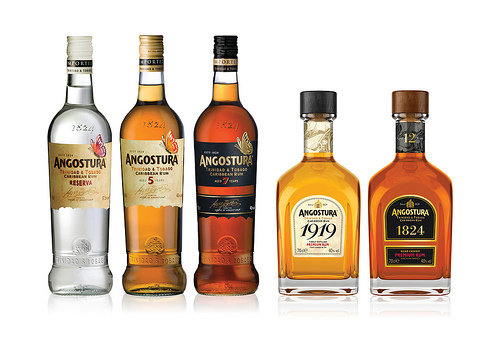 Ah, Angostura; now here’s a brand who know how to do things in style. 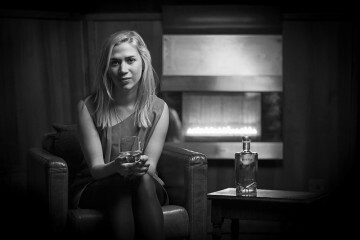 Take its annual competition to find a global brand ambassador to represent its portfolio of iconic bitters and rums for instance. 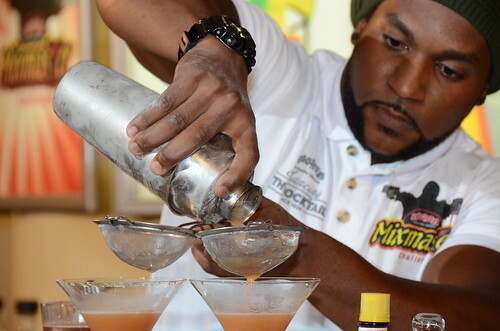 Not only does the company pull out all the stops flying in competitors, judges, distributors and media from all over the world, it treats them all to a week of rum and fun at the Trinidad carnival as well. Glorious sunshine, eye-popping costumes, winding* (or whining as they say in the Caribbean) and liming** aside, the main event was the competition itself. And boy, was it a show. 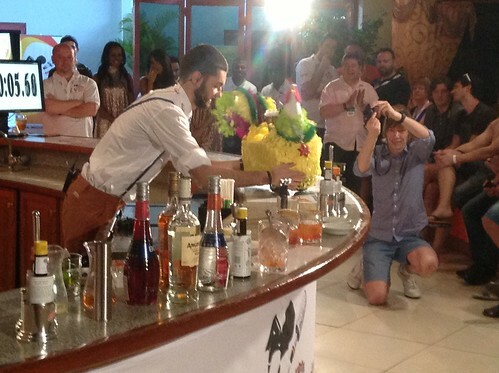 Held at Angostura HQ in Lavantille, Trinidad, the Angostura Aromatic Bitters Global Challenge 2013 certainly lived up to its name bringing together bartending talent from as far as New Zealand (Jake Searell); South Africa (Dominic Walsh); India (Pankaj Kamble) and Argentina (Daniel Biber). There were also representatives from Russia (Egor Stepanov); Ukraine (Stanislav Mukhin); USA (Sean Frederick), Canada (Oliver Stern), and good old London town (Elliot Ball). And lest we forget the Caribbean contingent from Jamaica (Ryan Mitoo) and Diago Martin in Trinidad (Daniyel Jones). Their collective influences and styles may have been vastly different but those who made it through to this global comp were united in one thing: a desire to dazzle the crack team of judges. Obviously, such a massive prize warrants a crack team of judges. Which is where Salvatore Calabrese (aka The Maestro and all-round cocktail guru), Ann Tuennerman (founder of the most prestigious event on the industry calendar : all hail Tales of The Cocktail in New Orleans); Hidetsugu Ueno (owner of Bar High Five in Japan and cocktail artist famed for his ice diamonds and shaking techniques); Vidia Doodnath (Executive Director, Technical Operations of the Angostura Group of Companies), and David Delaney Jnr (last year’s winner) came in. Dressed in their very fetching white Angostura chef coats and wearing their best, most serious judging faces, they were enlisted to cogitate, deliberate and score the cocktails proffered up by our magnificent eleven.. They certainly had their work cut out. 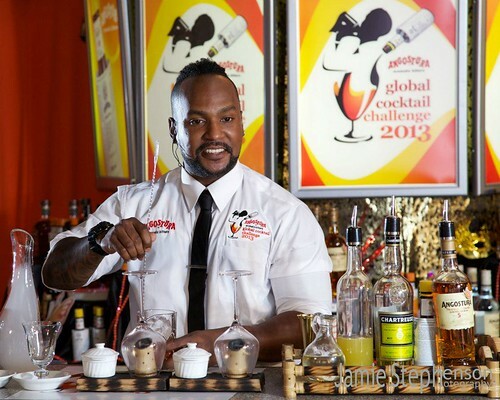 This was some of the finest bartending talent in Europe, Caribbean, Asia, Africa, North and South America after all. 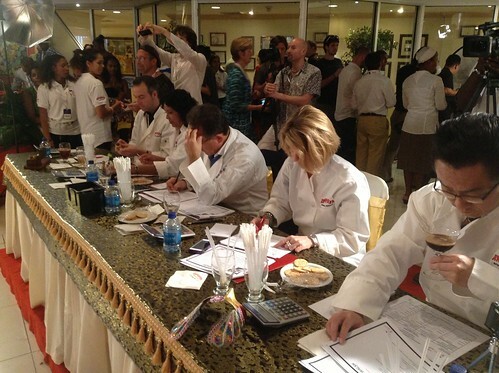 Having beaten off stiff competition in their regions to secure their place in the global finals, each contestant was determined to take the title home. To do so they had to create two drinks: one Rum Cocktail using Angostura rum and bitters; the other, a Freestyle Cocktail which gave them them the opportunity to show off their creativity using any spirit just so long as Angostura aromatic bitters was added to the mix. 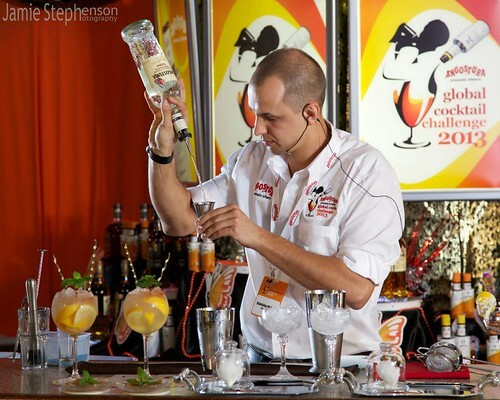 Stanislav Muhkin hit the jackpot with his Master’s Secret Rum Cocktail and Daniyel Jones won the best Freestyle Cocktail category with his Charmer (see recipes below). Daniyel also scooped the top spot. 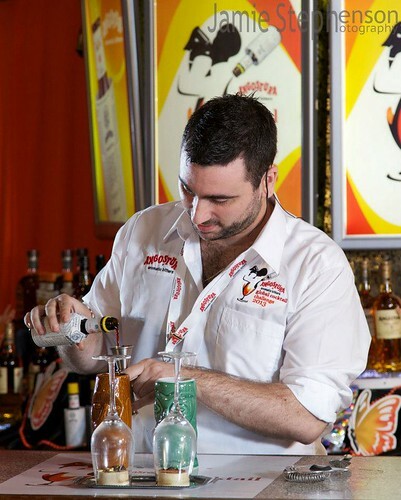 Little wonder really – his confidence, charm and cleverly crafted cocktails impressed the judges as well as the other contestants. It’s the first time in the competition’s eight year history that the prize has remained on home soil and if you’re thinking that an element of jiggery-pokery may have been involved, forget it. Our man Dan was a star from start to finish. His knowledge, expertise and passion was second to none. And what will Daniyel be doing with the money now that everyone in Trinidad knows his bank balance has been seriously boosted? “My fiancé and I have been engaged for three years,” he says with his customary gentle manner and winning smile. “The money will be going towards our wedding.” If you’re invited, cross your fingers he’ll be in charge of the cocktails. *Winding (or whining): a provocative dance with knees bent, legs in butterfly motion and a slow, sensual gyration of the hips. See Fig A. ** Liming: the very fine Trinidadian art of doing nothing or ‘just hanging around’. Shake all ingredients over ice made of mineral water and serve in a cocktail glass. Garnish with bay leaf foam infused with honey and bitters. Smoke glassware with fresh cinnamon bark soaked in Angostura® aromatic Bitters for three days. Stir ingredients over ice made of mineral water. Serve in white wine glass and garnish with Portugal peg seasoned with salt, black pepper, brown sugar and shadon-beni (cilantro) then smoked. Muddle grapefruit in a wine glass, add crushed ice and all ingredients, except Angostura® aromatic bitters, and mix using a bar spoon. 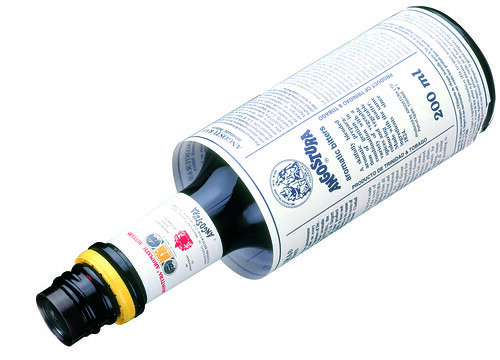 Place crushed ice on top and add Angostura® aromatic bitters. Garnish with dried lime zest and mint leaves. Muddle, shake, fine strain into a champagne flute. Garnish with birch bark and a Gypsophila flower. Swizzle ingredients in a Tiki mug and garnish with a mint sprig. Shake ingredients and build in a wine glass. Garnish with an orange twist. What makes a classic cocktail bar?